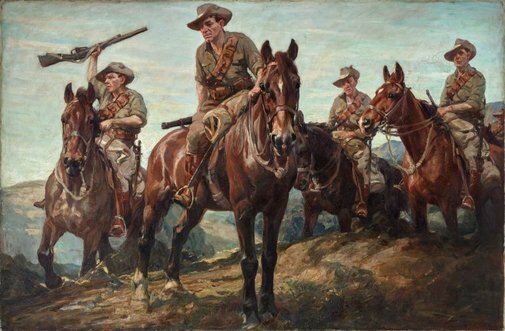 'The enemy in sight' was one of three paintings Septimus Power exhibited at the Royal Academy in London in 1916. Painted before he was commissioned as an official war artist, it is an imaginative construction that owes as much to the heroic narratives of the popular press and the image of the bushman–soldier as it does to Power's genuine affinity with horsemanship. The subject for one of the soldiers was Sergeant-Major BG Watts-Phillips of the 8th Light Horse Regiment, who was convalescing in London at the time. Adelaide's The Register said Watts-Phillips possessed 'not only a splendid type of manhood, but… the dramatic instinct'. Watts-Phillips assisted Power with wrangling the horses in his studio. Power worked on the picture for three months before Watts-Phillips returned to the front. Signed and dated l.r., "H. S. Power 1916". Nicolas Brasch, Horses in Australia: an illustrated history , 'Walers at war', pg. 98-117, Sydney, 2014, 107 (colour illus. ).